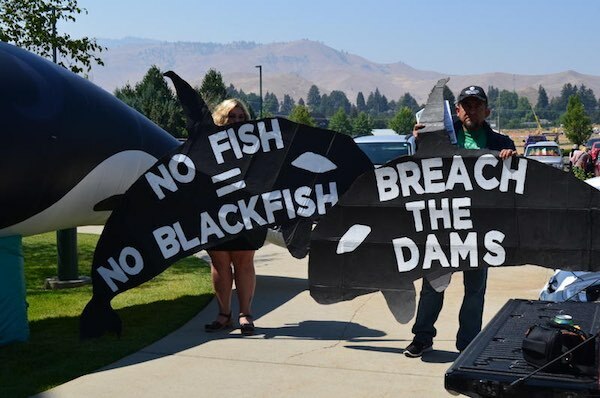 Advocates for salmon and for orcas gathered outside the meeting to press for "bold actions,"
including removing the four lower Snake River dams. On Tuesday, the governor's orca task force met in Wenatchee to come up with a long-term plan to help the recovery of the orca population that spends much of its time in or around the Puget Sound (known as the Southern Residents). Advocates for salmon and for orcas gathered outside the meeting to press for "bold actions," including removing the four lower Snake River dams. The advocates delivered a petition calling for dam removal and other steps to the task force co-chairs. Dam removal isn't the only controversial recommendation the task force has on the table. It's considering options that include further limiting the Chinook harvest in some places, reducing bycatch in other fisheries, and negotiating reductions in Alaskan and Canadian fisheries to allow more fish to reach Washington waters. "That would be a moon shot," Day acknowledged.